Top o’ the morning to you, Costco Food Find fans. How ya doing. Tis the time for another Costco Food Find post. I am going to help you find the pot of gold at the end of the Costco rainbow – while being a stereotypical Irish as possible. Plenty of St. Patrick’s Day themed items (we got bangers, shamrock raviolis, butter, and more!) are featured in this month’s post. Pick up these things and make your friends whether human or leprechaun green with envy. First let’s addresses what your corned beef options are. You can make it yourself completely from scratch with your own seasonings. Or you can buy brisket that is already been brined and comes with a seasoning pack. Let’s look at the already brined option. 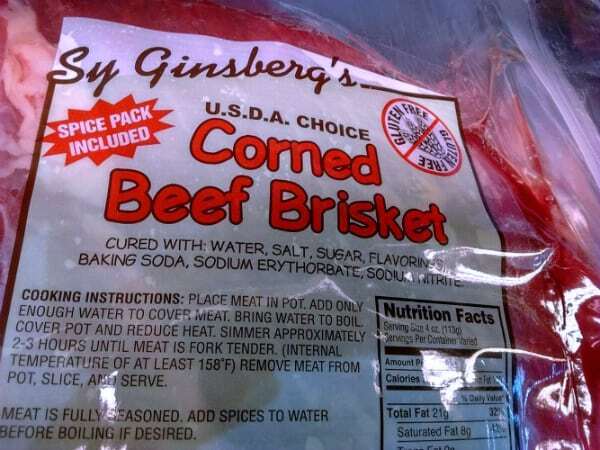 Sy Ginsberg’s Corned Beef. A Michigan made product. I prefer to make my own corned beef that does not include sodium nitrate. It contains sodium nitrate. This is a preservative. I am not a fan of preservatives. They never do anything for flavor and may potential be bad for you. I try to avoid them as much as I can in meat products. I also don’t like that I can’t control the sodium and corned beef is usually pretty salty. 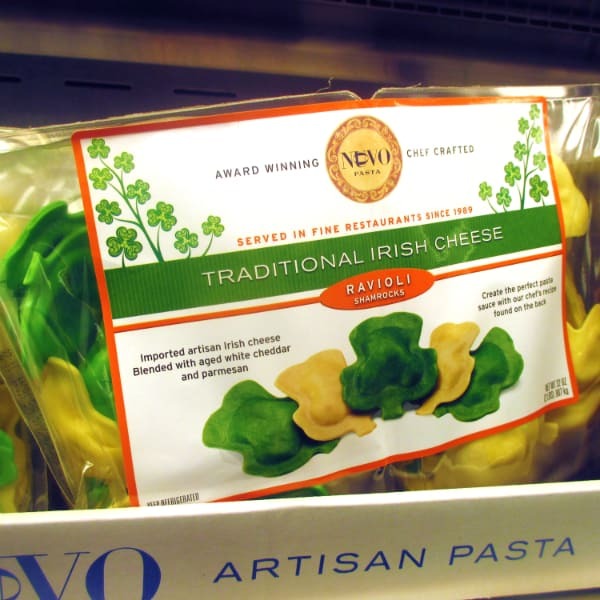 If your not eating this stuff everyday, don’t feel guilty about buying it to celebrate St. Patrick’s Day. But you are better off buying brisket and seasoning it yourself. The flat cut brisket is my favorite cut for corned beef. This is my favorite cut for making corned beef. The flat cut contains less fat than the point cut. Even if you don’t have much time, I have a quick method for brining your own corned beef. Do note the brisket without the nitrate will not have the same pinkish color corned beef is known for. I am ok with that. 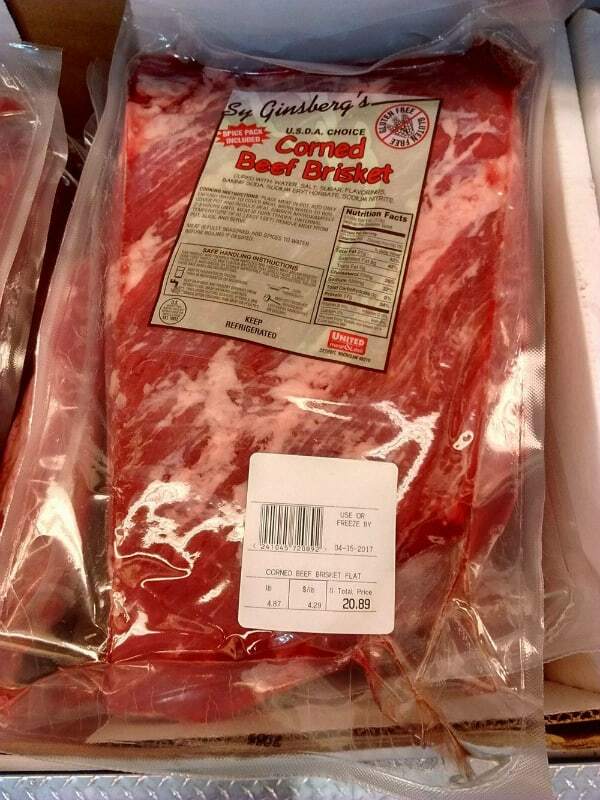 Whole USDA Prime Brisket can be used to make corned beef for St. Patrick’s Day. 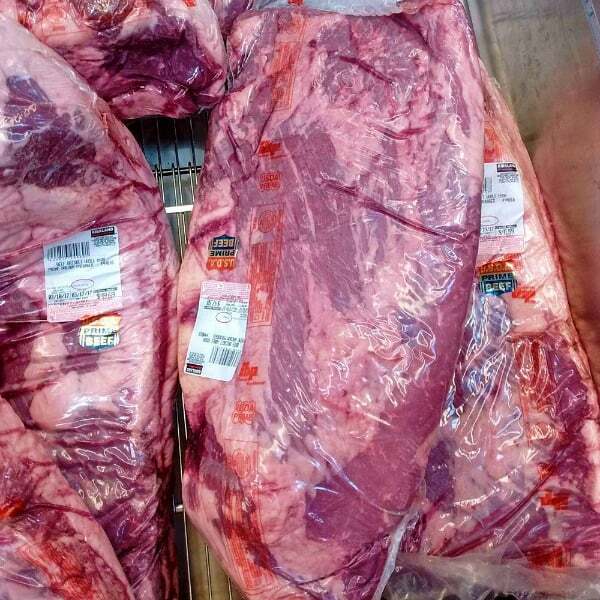 Costco offers the option to go with prime grade meat for your brisket. You do buy the entire brisket, which is a lot of meat. You can cut it up at home and freeze it for other occasions. 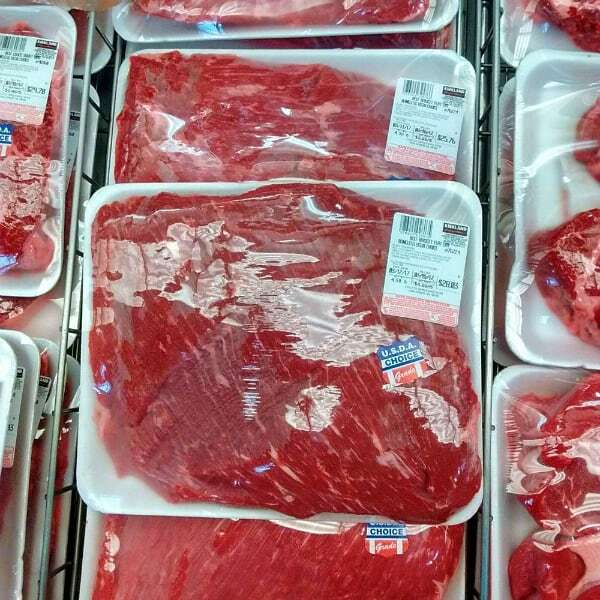 But if you don’t want to invest in that much meat (it is a better per pound price), than just go with smaller, more manageable choice flat cut I previously mentioned. 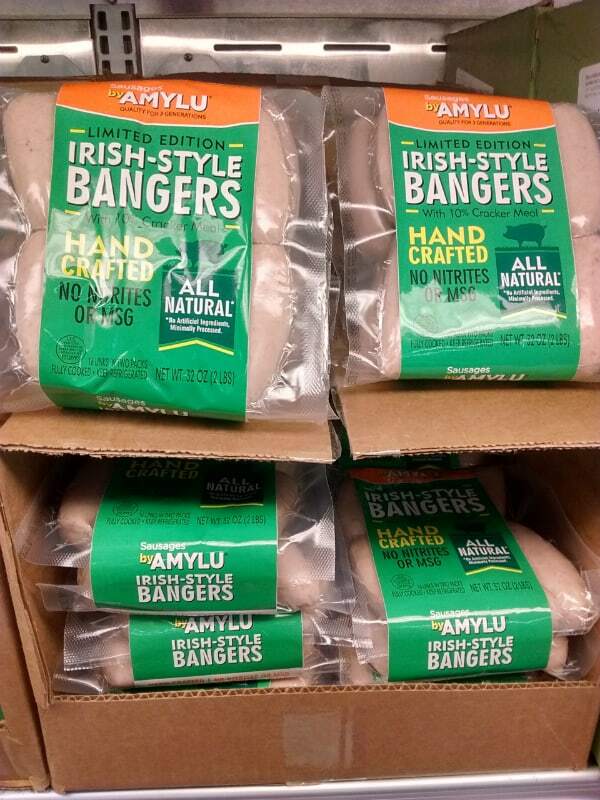 I love these Irish Style Bangers. Only available for a limited time. For a classic comfort dish, Bangers and Mash, these bangers from Sausags by Amylu are really good (see my review). They well seasoned sausage that are not spicy. Their skin gives them a nice bite. I highly recommend them if you aren’t going to cook them for St. Patrick’s Day. You can freeze them and pull them out for Easter brunch in a few weeks. My son just loves these ravioli. Can’t believe how many he ate last time! I reviewed them last year and they are just as good this year. I like to serve the with a creamy tomato sauce. And for extra flavor, pan fry them to get them brown after you boil them. Give them a try. Even if you just think they are cute. Create an Irish cheese board and include Kerrygold Dubliner cheese. I love including a few cheeses for my first course during my St. Patrick’s Day celebration. 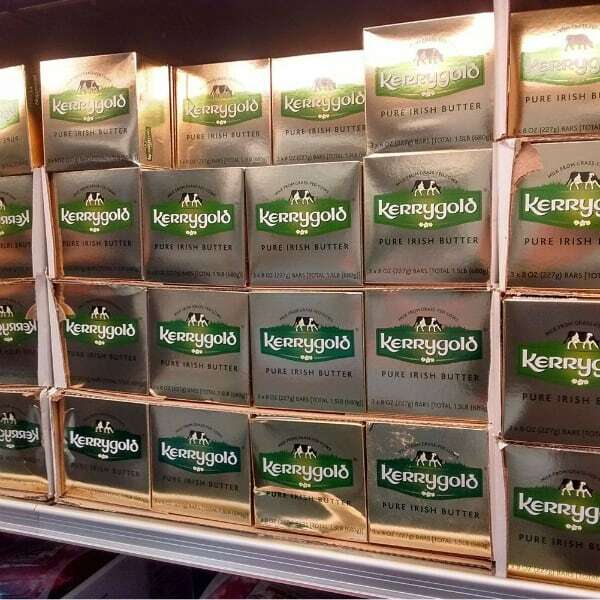 Kerrygold Dubliner has a sweet/nutty flavor. It is similar in texture to an aged cheddar. The milk used comes from grass-fed cows. When the cow eats what is meant to eat, I think that anything produced from the milk has better flavor, richer. Don’t believe me – try making hamburgers with regular ground beef and with grass-fed ground beef. You will taste the difference. I always use St. Patty’s Day as an excuse to buy this ingredient grass-fed butter. I can’t begin to say how much I love this butter. 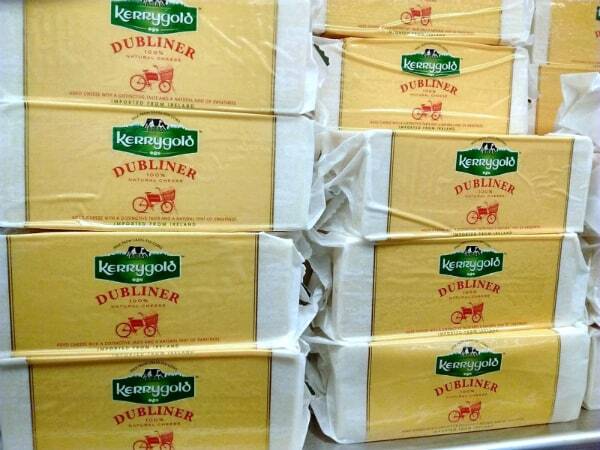 If there there really was a pot of gold at the end of the rainbow it would be full of this butter. If you have only purchased store brand butter or regular Land O Lakes, you will be in for a treat. You will first notice that the color of the butter is more yellow. The flavor is richer. Yes, the cost more, so it’s not my everyday butter. But for St. Patrick’s Day, it is a must have at my dinner table, spread onto some Irish soda bread. 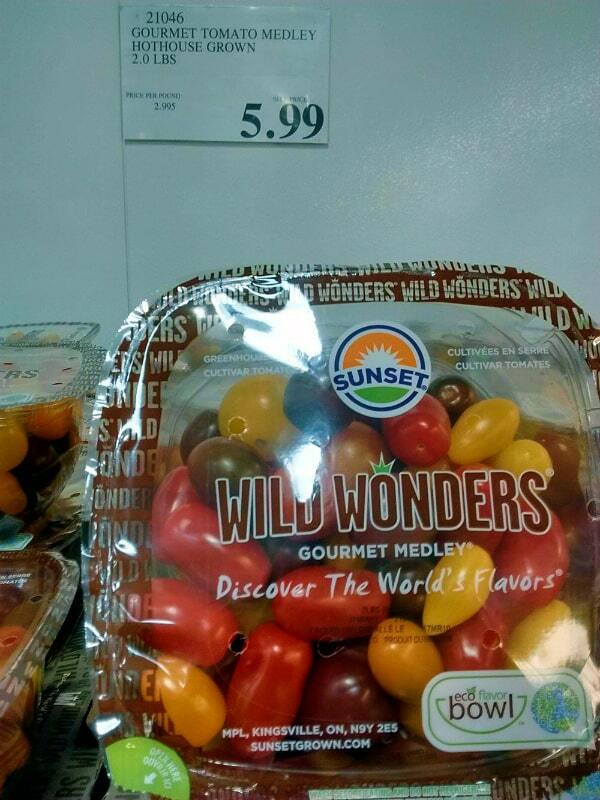 These Wild Wonders Tomatoes are going to be your best small sized tomatoes that you are probably going to find in a grocery store, especially Costco. For hot house grown tomatoes, these are pretty good. I have heard that the company fills these with their tomatoes they are testing. You are getting a sneak peak at what one day might become a tomato that will stand on it’s own. In terms of what I have seen offered at Costco, these are going to be your best cherry or grape tomatoes you’ll find at this store. The most crisp apple I found at Costco in March is the Pink Lady. This time of year it gets harder and harder to find good apples. Pink Lady is your best choice if you want something with some crispiness left in it. 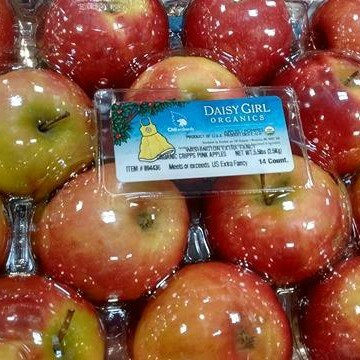 Pink Lady apples get sweeter as they are stay in cold storage. A buck ninety-nine for organic apples is a good deal. That is the lowest price you will see at Whole Foods for organic apples. 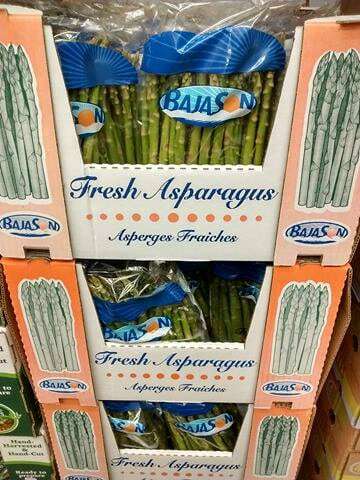 Organic asparagus is only available for a limited time of year. Most of the asparagus you find in store the majority of the year are from Peru and there isn’t a lot of organic asparagus coming out of Peru. 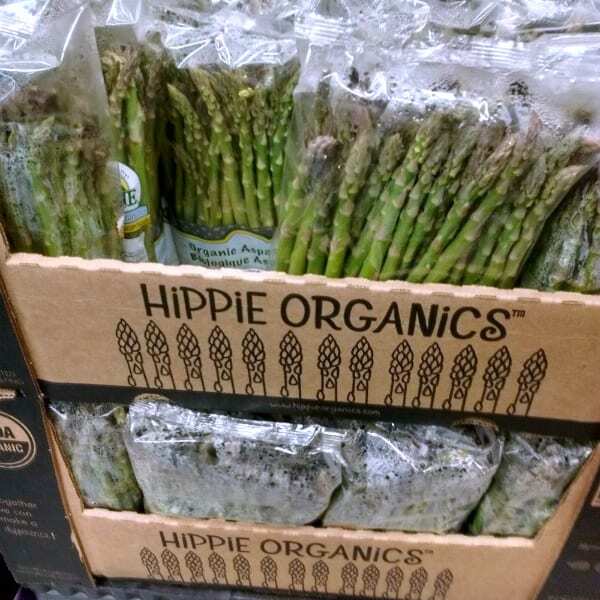 But once we switch more into Mexico and California asparagus season you see organic. I don’t think I can seen organic asparagus for this low of a price before, so it’s a steal. Mexican grown asparagus is now in season which means asparagus prices are going down. Depending on where it is coming from, I am ok with conventionally grown asparagus. When coming from a cold climate like here in Michigan, you more likely to avoid pesticides. That is because when asparagus is coming up here, there aren’t many bugs, so less need to spray. I don’t know how that holds true with asparagus from warmer climates like in Mexico or California. Asparagus is on the Clean 15 list, which is a list of produce items that are safer to buy conventional than fruits and veggies. These are items you will find in the aisles or in the frozen or refrigerated section. 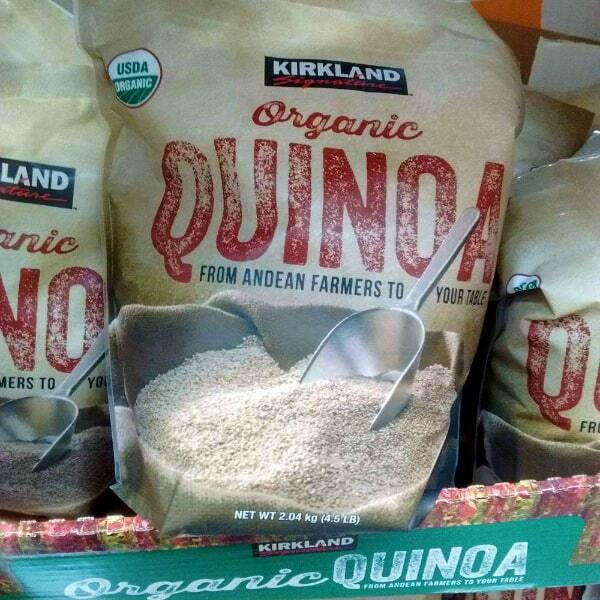 A large bag of organic quinoa – one of the most trendy ingredients. What do you think of quinoa? Do you use it? This grain has been around forever but in recent years it has become quite popular in the US. It is known for being a great protein source, a nice alternative to white rice. Definitely more expensive than white rice. Buying in bulk at Costco at $2.55 per pound is a great value. If you haven’t tried it before I would recommend getting it somewhere else first, so you don’t end up throwing out your savings. A popular grape juice during Passover season. Whenever buying grape juice I look for two things. First I want to to be 100% juice, no juice cocktail, no sugar added. Second, I want to include concord grapes. Now most juices that you see aren’t 100% concord grapes, they will say made with concord grapes. They mix in other types. The Concord has the rich flavor you want. 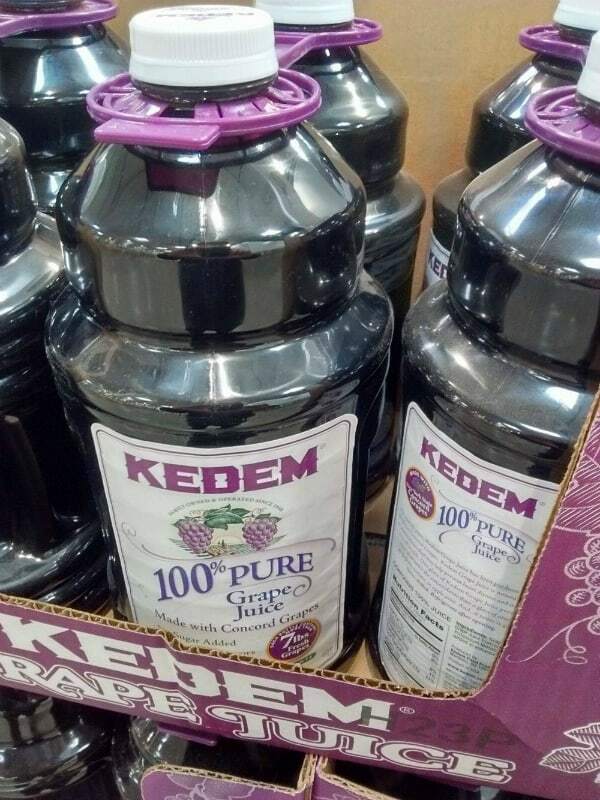 Kedem Grape Juice fulfills these two things. You see it quite often during Passover season. This pineapple juice looks really good. Look closely you can see that the juice is separating, a sign that it has been processed less which means better flavor. 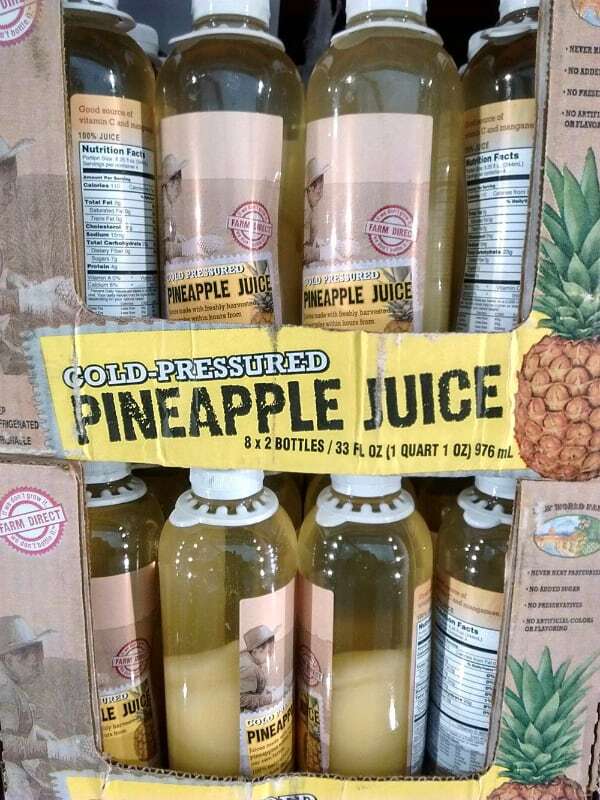 Here is something I was excited to see at Cosstco – cold pressured pineapple juice. Instead of pasteurizing the juice with heat that kills any harmful bacteria but also the vitamins and the flavor of juice, high pressure is used without heat. This eliminates the bacteria while keeping more of the good stuff. The juice was separated in the bottle and it needs to be shaken before consuming. Check out this video to learn more about the process. I hope you enjoy this St. Patrick’s Day themed Costco Food Finds. 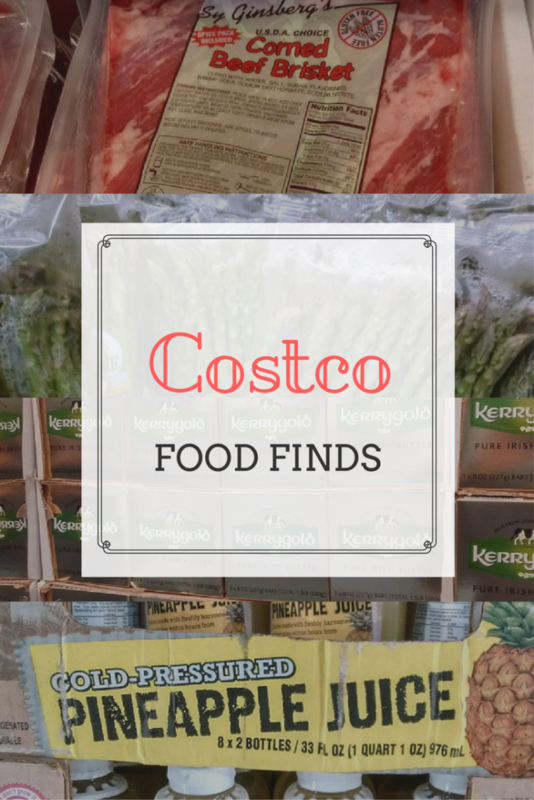 If you like this post, make sure you sign up for my Costco newsletter and never miss out on any of my suggestions, tips, and recipes that will help you make the most of your Costco membership. When they are at their peak, yes they are. I tend to find that the around this time of year, they are not nearly as good and the Pink Lady apples are more reliable. The Costco in Livermore, CA is selling Farmhouse Culture Beet & Ginger Gut Shot, which I know you reviewed, for $3.69/bottle (compare to $5.99 at Whole Foods). I really like it and hope they get more flavors! Wow. Didn’t know Costco carried it. Could be a regional thing. I will check at my Costco next time just to see. Thanks for sharing that.